The Vintage Stereo Ensemble provides the classic “stereo ensemble” effect, found on many vintage synthesizers from almost any brand and make. In stereo ensemble effect, the delayed, processed and filtered sound is added back to the dry (mono) audio with inverted phase for one channel, and direct phase in the other. This gives it the distinct and unique moving character, different from that obtained with chorus effects. However, use of inverted phase in stereo field also adds certain peculiarities to watch out for. For example, when such stereo audio is played back on an older “surround” decoding sound system, ensemble effect sound may move to the rear sound channel. Also, if the output gets mixed back to mono, the effect may disappear. This also applies to mono subwoofer systems, or speakers that are placed too close. This is normal, and occurs with any similar vintage stereo ensemble processing. In this case and if such oddities are undesirable, to avoid mono mixing issues, you can choose to use only one of the output channels, or use two separate ensemble processors for left and right channels. 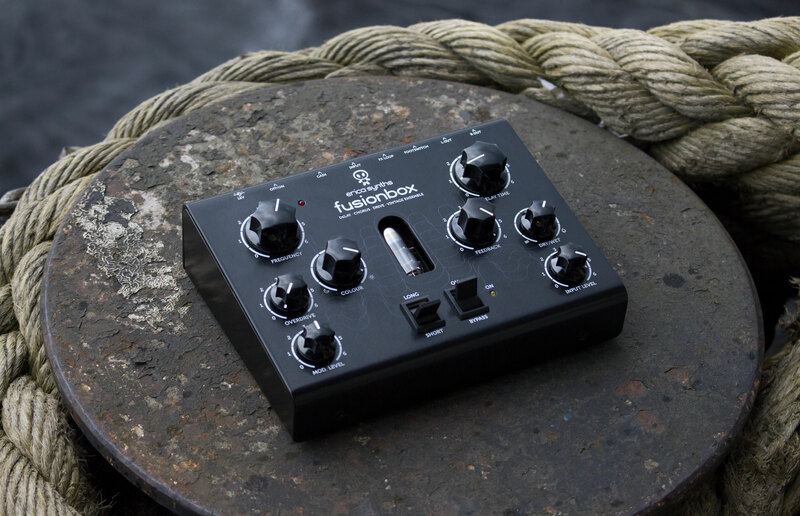 Fusionbox has adjustable input gain, therefore it works with various sound sources – guitars, units with line level signals (synthesizers, grooveboxes, etc.) 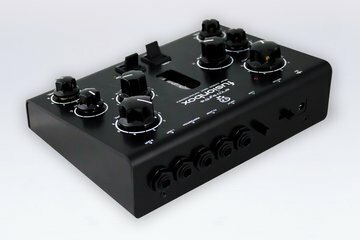 and modular synths. 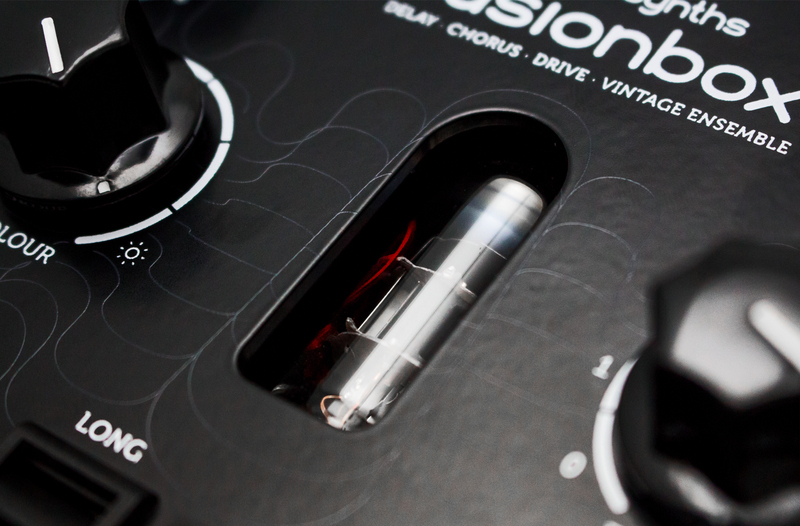 Footswitch allows to switch on or bypass effects making Fusionbox ideal for guitar players. Why is the FusionBox’s output signal so noisy? 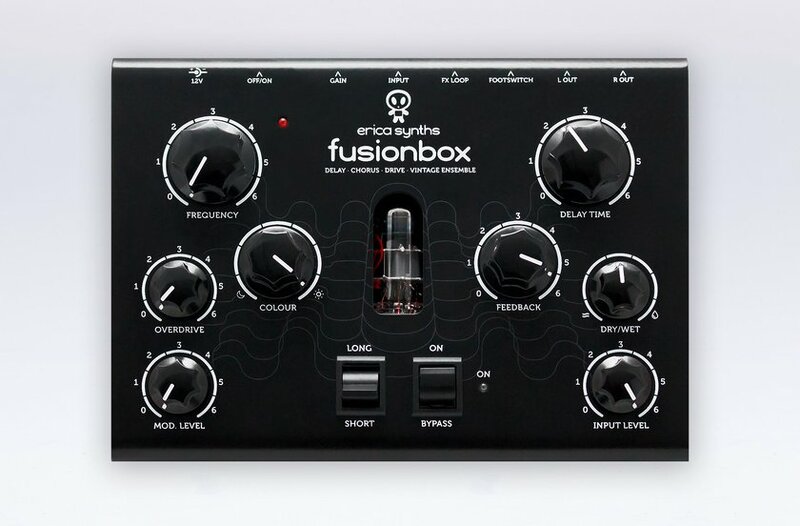 The modulation delay of the FusionBox is comprised of BBD chips, which were an essential part of "ensemble", "stereo symphonic" and "chorus"-like effects in many musical instruments and effects throughout recent history. These chips each offer a certain amount of delay, with more delay ones being noisier and more nonlinear. Running these chips slower than typical offers more delay also decreases quality. In contrast to a digital delay, which provides mostly very clean and transparent sound, yet colourless sound, this discretized analog cell memory has its own dark, lo-fi and gritty character. When the delay time is set to short (making the delay to run at high samplerate), as well as only one BBD chip (TIME x1) is selected, the sound quality is at its best – to the capabilities of these chips. In almost all vintage musical instruments and effects, that have these chips, they are run at high samplerate, providing only a very short delay for the "stereo ensemble" effect. Also, many such instruments utilize a hidden output muting or noisegating techniques: for example, gating outputs whenever all voice VCAs are at their minimum. In most cases of ensemble effect implementation in vintage instruments, delay output was low-pass filtered using an internal non-alterable filter. On this effect’s unit, this filtering can be freely adjusted from very dark to unfiltered using the COLOUR knob. Our effects unit provides the typical, ungated sound of these BBD chips while allowing incomparably wider range of delay time variation. Noise gate pedal or effect can be added after the delay unit if idle noise is unwanted. 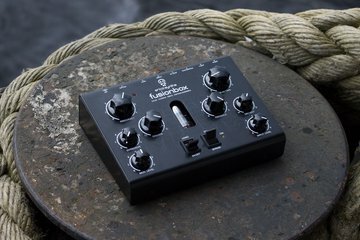 Increasing feedback builds up significantly more noise, as well as selecting long mode (adding additional BBD stages) and dialling long delay times, along with overdrive feature giving it an extreme edge. Preserving this gritty and noisy character was the purpose of this effects unit.